Opinion: Is Elon Musk OK? The world has seemed to turn on the Tesla Motors and SpaceX CEO. Although once widely worshiped, Elon Musk has accomplished a growing list of controversies within the past year. Tesla has been under numerous instances of scrutiny for Musk’s off-character behavior, including his refusal to respond to “boring, bonehead questions” when met with criticism of failing to meet car production targets for the Model 3. But this won’t be the final instance of Elon’s costly Twitter-happy outbursts. “Am considering taking Tesla private at $420. Funding secure,” he had boasted on August 7, 2018. This particular tweet only further aggravated Musk’s feud with the S.E.C., ultimately resulting in an ugly lawsuit forcing him to step down as chairman for at least three years. The public used to think of Elon Musk as the greatest innovator of the 21st century, a man excelling beyond greatness. He has made unattainable dreams a reality thanks to his genius. Musk largely contributed to the establishment of PayPal in 1999, one of the world’s largest world wide web payment systems. He founded SpaceX a year later with the hopes of commercializing space travel and possibly colonizing Mars to preserve humanity. He built the Tesla in order “to accelerate the world’s transition to sustainable energy” using impressively high performing electric cars. More of Musk’s accomplishments pile on, from Hyperloop to OpenAI to The Boring Company. He appeared to be on the forefront of cutting-edge technology, a real life Tony Stark-esque figure, his grandiose intellect one of universal reverance. So what happened? What went wrong? Musk has “gone from looking like the visionary genius to looking like the out-of-control guy who probably is on the borderline of a breakdown,” stated Erik Gordon, business professor at the University of Michigan. Maybe Gordon is correct, as Musk himself has been working an agonizing 120 hours a week without vacation. And this is a typical schedule for him. Even on his 47th birthday, he spent each draining hour at work. “All night — no friends, nothing,” he emotionally revealed in an interview with The New York Times. And perhaps his work habits have taken their emotional and psychological toll. To be lonely, in a position of high power, and having alienating intellect is undoubtedly unhealthy for any person if he has swept it all under the rug. 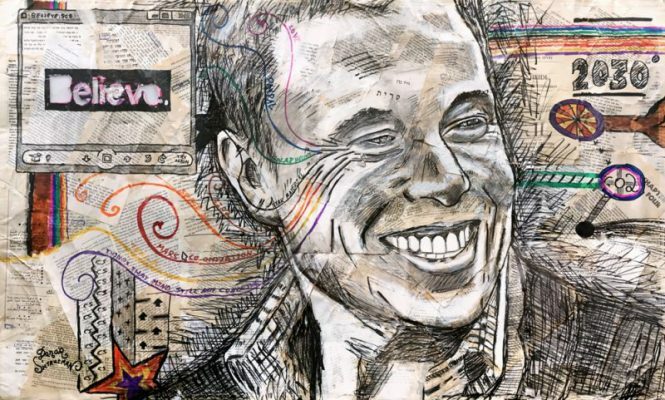 Though entrepreneurs tend to have “higher levels of creativity, higher levels of energy,” they also risk “a sense of urgency, and greater restlessness,” which explains Musk’s recent social media habits, according to UCSF clinical professor of psychiatry Michael A. Freeman. His impulsivity and Twitter rants and smoking marijuana on live broadcasts may all be caused by an underlying mental health imbalance. Whether or not he chooses to directly acknowledge his personal struggles during this disastrous year remains to be addressed in the future.